NOTCH APPARATUS for engineering schools. NOTCH APPARATUS, technical teaching equipment for engineering -Notches or Weirs allow hydrologists and engineers a simple method of measuring the volumetric flow rate in small to medium-sized streams, or in industrial discharge locations. The apparatus is used to calibrate the following types of notches:- Rectangular Notch. Triangular Notch. Trapezoidal Notch or Cipolletti Weir. A flow control valve permits variation of flow rate through the circuit.Open flow channel with necessary baffle ensures smooth flow of water. Channel has arrangement to replace different types of notches through simple bolting arrangement. Open Flow Channel: 250 x 200 x 1000 mm. Rectangular Notch :50 mm wide. Triangular Notch: 450 and 600. Trapezoidal Notch : Slope 1:4. Sump tank capacity : 100 litres MOC: 18 X 18 X 24 Electro- Plating Tank (PVC). Volumetric tank capacity : 40 litres MOC: SS-304 with Matt Buffing. Pump : Monoblock type, 0-60 litre/min, Motor 0.5 HP. Piping with necessary Valves and Fittings. Digital Stop Watch with 1/10 second Accuracy. Detailed Technical Manual and On-site demo. 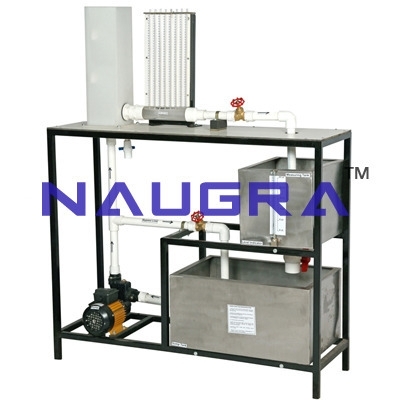 We are leading manufacturers, suppliers & exporters of NOTCH APPARATUS for engineering schools. Contact us to get high quality designed NOTCH APPARATUS for engineering schools for schools, colleges, universities, research labs, laboratories and various industries. We accept bulk orders for government tenders in all countries around the globe.